Kate, 35, made a private visit to HMP Eastwood Park in Gloucestershire to learn about the complex needs female inmates face, including those with children. Kate also met with a small number of female prisoners at HMP Eastwood Park to hear their personal stories, according to a statement from Kensington Palace. "The Duchess wants to see the support helping vulnerable families break the cycles at the heart of issues like addiction and mental health,” the statement read. Kensington Palace said Kate's visit to the prison today follows a visit she made last September where she joined with Rehabilitation of Addicted Prisoners Trust (RAPt), a charity helping prisoners addicted to drugs and alcohol. "This visit continues to build on similar themes, as The Duchess seeks to broaden her understanding of problems such as addiction, poor mental health, and family breakdown and what support can be offered to vulnerable families to help break the cycles which are so often at the heart of these issues," Kensington Palace said in a statement. Following the private visit to the prison, Kate stopped at the Nelson Trust Women's Center, which supports 500 women who have survived or are struggling with trauma and abuse. Kate, dressed in a blue Mulberry coat and Dolce & Gabbana skirt, was presented with a bouquet of flowers by a 4-year-old girl. "Thank you so much. I think George will like them,” Kate told the young girl, referring to her 3-year-old son Prince George. Kate also cooed over a 4-month-old boy whose mother is being supported at Nelson Trust Women's Center after she recently left the prison system. 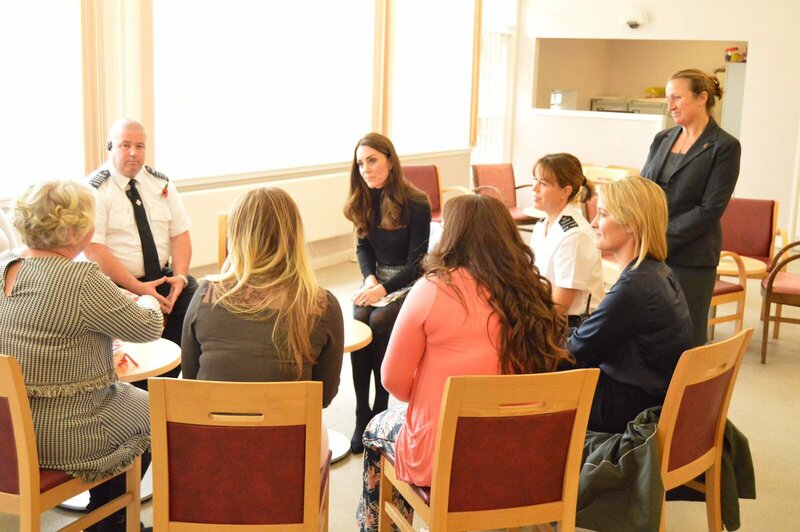 Kate also spent time with staff at the Nelson Trust Women's Center to hear about the underlying issues many of the women there face like addiction, abuse and mental health. Princess Kate and Princes William and Harry have made mental health support one of the cornerstones of their charitable initiative. They hope tackling mental health issues at the outset will help people who struggle with homelessness, social exclusion and other issues. Last night, Kate attended the London premiere of “A Street Cat Named Bob,” in support of Action on Addiction, a charity of which Kate is patron. “Is that purring or growling?” Kate jokingly asked Bob's owner, James Bowen, whose real-life story as a homeless man whose life was changed by the cat is portrayed in the movie. Kate wore a stunning cream lace gown by the label Self Portrait to the red carpet premiere. She also spent time privately viewing three films made by recovering addicts at the Recovery Street Film Festival.